Things have been quiet on the Green Drinks front....but that's about to change! 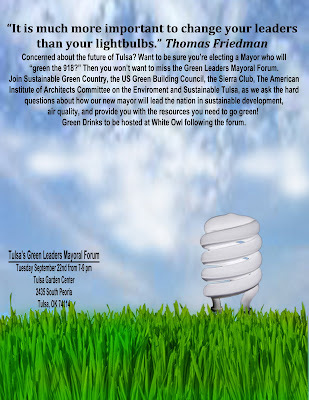 Together with Sustainable Green Country, the US Green Building Council, the American Institute of Architecture Committee on the Environment, the Sierra Club, and Sustainable Tulsa we've been planning the Green Leaders Mayoral Forum. Each representative group will ask the candidates our questions on how they plan to develop sustainably, improve air quality, and provide Tulsans with the resources we need to be a national leader. If there is time remaining the flooor will be open to questions from the public. It's free to attend and afterwards we'll move to the White Owl for Green Drinks. There are some really cool plans for the future of Green Drinks. From now on, we'll be partnering with the US Green building council each month to hold the meetings as we move around Tulsa to showcase all that this city has to offer. From coffee shops to restaurants, museums to galleries - Green Drinks is continuing to gain momentum and exposure. You won't want to miss out! You also won't want to miss out on the last few weeks of the farmers markets. Check out www.BuyFreshBuyLocalOK.com for your 2009 farmers market guide.